Citation Information: J Clin Invest. 2019;129(2):820-833. https://doi.org/10.1172/JCI122954. 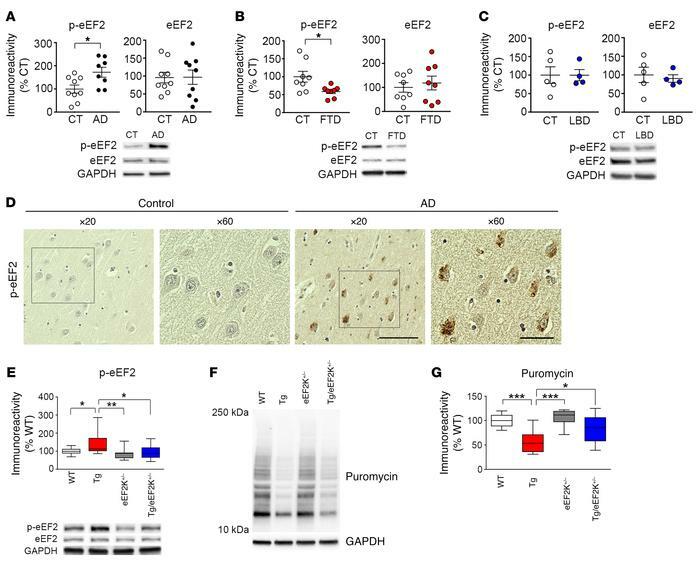 Hyperphosphorylation of eEF2 in the AD hippocampus. (A) Postmortem human hippocampal lysates from AD patients exhibit increased eEF2 phosphorylation compared with those of age-matched controls (CT). n = 9. *P < 0.05, unpaired t test. (B) Human postmortem hippocampal tissue from FTD patients shows decreased eEF2 phosphorylation compared with that of healthy controls. Controls, n = 8; FTD, n = 5. **P < 0.01, unpaired t test. (C) eEF2 phosphorylation is not affected in hippocampal tissue from LBD patients (n = 4) compared with that of age-matched controls. n = 5. P = 0.99, unpaired t test. Error bars for human patient data indicate ± SEM. (D) Representative images demonstrating hyperphosphorylation of eEF2 in the AD hippocampus. Insets are shown at ×60 magnification. Scale bars: 300 μm (×20); 40 μm (×60). Immunohistochemical experiments were replicated 3 times. (E) Genetic reduction of eEF2K corrects eEF2 hyperphosphorylation in hippocampal lysates from Tg19959 AD model mice. n = 10. *P < 0.05; **P < 0.01, 1-way ANOVA with Tukey’s post hoc test. (F) Representative images from SUnSET puromycin incorporation assay. Image shows 10–250 kDa range. (G) Quantification of de novo protein synthesis via SUnSET assay. WT, n = 6 mice; Tg19959, n = 5; eEF2K+/–, n = 4; Tg19959/eEF2K+/–, n = 8. *P < 0.05; ***P < 0.001, 1-way ANOVA with Tukey’s post hoc test. Box and whisker plots represent the interquartile range, with the line across the box indicating the median. Whiskers show the highest and lowest values detected.